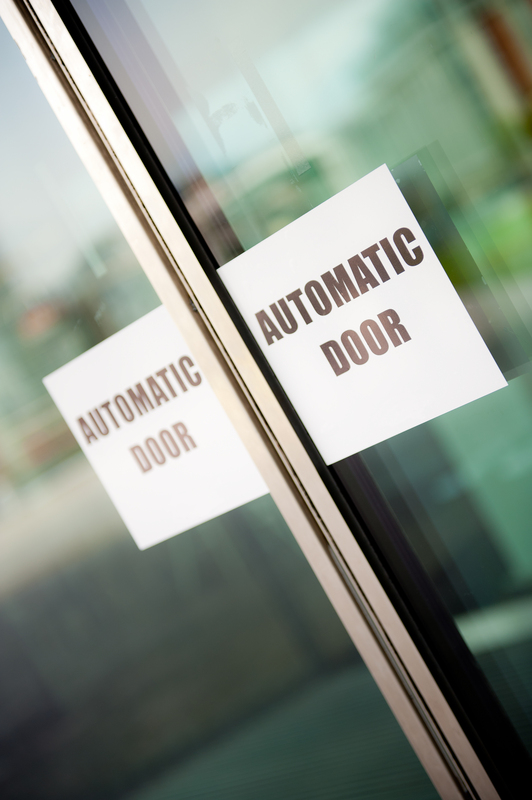 Automatic Door Signage: Is It Required By Law? As with the BS EN16005 and BS 7036-0, the short answer is no. However, not following the safety guidelines as illustrated by these standards may cause injury to the public. Regarding automatic door signage specifically, this guideline which is outlined in Section 11 of the BS7036-0 states that door signage “should be used to instruct and inform users to keep away from the space through which a power operated door travel.” Basically, it is a warning sign, there to prevent the public from obstructing or injuring themselves via the doors. For example, should an automatic door not have the signage on it, the disabled or elderly may not be aware that it is automated. This can cause accidents and obstruction. The BS EN16005 itself states “Warning signs shall be used to draw the users’ attention to residual risks, if any.” However, the automatic doors can be a risk in itself, so we advise that signage is placed at all times. This, therefore would give the owner of the premises responsibility for any accidents that occur due to the lack of signage displayed. We would, therefore, advise members that maintain/install automatic doors which have the signage removed, that you make a record of it within the log book. Details on positioning and requirements of the signs are outlined within the BS 7036-0 which is covered when you take the BS EN16005 course and exam. You can read more about the BS EN16005 here. Is it the law for automatic doors to have signage? Are Manual Activated Doors Still Classed As Automatic? What ADIA Shop Items Do You Need on a Daily Basis?